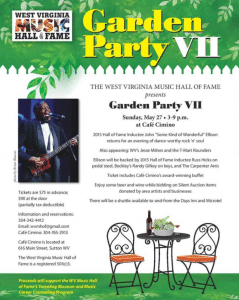 The 7th Annual Garden Party is a fundraiser for the WV Music Hall of Fame is set for Sunday, May 27, 2018 at Cafe Cimino in Sutton, WV from 3-9:00 p.m. It is a fun filled day-great music, great food, great cause! Also appearing are 2013 inductee Bob Thompson and WV jazz guitar great Vince Lewis, and WV’s Jesse Milnes and the T-Mart Rounders. Silent and Live Auction Items will sent home to the highest bidders. Rooms at the Inn are 10% off for this event! Tickets are $75 in advance; $90 at the door. 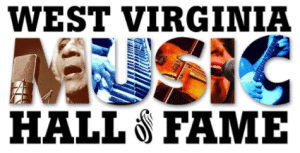 This annual event raises money to support the WVMHoF’s two education programs, the Traveling Museum and the Music Career Counseling Program. Keep reading for more info about those programs.